FILE - Men on camels cross the water as a woman washes clothes in Lake Chad at Ngouboua. The once expansive and vital Lake Chad has lost as much as 90 percent of its water in the past 50 years. Experts from the six member states of the Lake Chad Basin Commission met in Cameroon to put together a plan to save the lake that will be presented at the Paris climate change summit in December. The proposal centers on transferring water from the majestic 3.7 million square kilometer Congo River basin to the vanishing Lake Chad River basin. The Congo River basin is the second largest in the world, after the Amazon River basin. Experts say that could improve the lives of over 40 million people in the countries that surround Lake Chad — Chad, Cameroon, the Central African Republic, Nigeria, Niger and Libya. Swaibou Mahaman, environmental expert at the Lake Chad Basin Commission, urged world leaders meeting in Paris to take the proposal seriously. He said the neighboring Congo River basin has enough water to help. He said Lake Chad’s surface area has reduced by 90 percent from 25,000 square kilometers in 1960, but the population depending on the lake for their livelihoods has increased from 3.5 million to over 40 million inhabitants. He pointed out that figure is not including the animals, plants and birds that also exert pressure on the disappearing lake. For the water transfer project to go forward, the governments of the Democratic Republic of Congo, the Central African Republic and the Republic of Congo must allow the Lake Chad Basin Commission to use their territories and water resources. 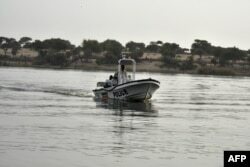 FILE - A boat of the Chadian police sailing on Lake Chad. The experts say they await the green light in Paris. The project would cost $14.5 billion. No funding is currently available. Deepening poverty around Lake Chad is also linked to regional insecurity, in particular the cross-border expansion of militant Nigerian sect Boko Haram. Mana Boukary, representative of the executive secretary of the Lake Chad Basin Commission, said the commission also plans to canvas donors for $80 million to create jobs for youths. Boukary said young people in the Lake Chad basin are joining the Boko Haram terrorist group because of lack of jobs and difficult economic conditions resulting from the drying up of the lake and the extinction of its resources that should have created livelihoods for them. The drying up of Lake Chad has been attributed to changing weather patterns and human activity.